Roger Black Gold Exercise Bike Review - Hype or Hit? Using an exercise bike in the comfort of your own home is a great way to keep fit on your own terms, and at a low cost. How good is the Roger Black gold exercise bike really? Is it a fantastically priced, high quality option, or is it product hype that doesn’t live up to the promise the professional endorsement implies? A quick glance at the key features and specifications of the Roger Black gold exercise bike is reassuring. It ticks all the key boxes, especially when you consider it’s available for around £190, and even cheaper on special offer at the major retail outlets. Console tells you: Time, Speed, Pulse, Calorie, RPM, Program. 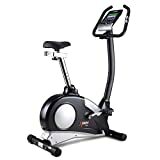 Generally, going on the specifications alone, this exercise bike is sturdy, with compact dimensions that still allow taller and heavier users to operate it, and it is made from good quality materials for the price it is available at. How easy it is to assemble the Roger black gold exercise bike is obviously going to depend on who you are, and what experience you have. It only took me an hour to take this exercise bike out of the box, summarise all the parts, and then construct it. Reviews on retail sites from people who have bought this exercise bike suggest that it can take up to 2 hours, but those reviews seem to be mostly from more elderly or inexperienced people, which would make sense. So I would allow 1-2 hours to completely construct this exercise bike, which is not unusual and at the end of the day it’s better to take your time and get it right. The only thing I would say is that it is a little tricky to connect up the monitoring console to the wiring. This is also highlighted in user reviews, and it’s something you need to be aware of, but it’s really not a huge deal in reality. This is a good-looking exercise bike, in black, unsurprisingly considering who endorsed it, that sits snugly in the corner of a room when you don’t want to use it, and has a good range of options. But how good is it to actually use? Well the first piece of good news is that despite its compact dimensions, even a taller, heavier person can use it comfortably. On top of that, you really can hammer at it and it remains sturdy. It doesn’t wobble and make you feel like it’s going to fall over on top of you, leaving you with broken bones and the possibility of a hospital visit plus ridicule on social media! There are 16 different resistance settings on the magnetic flywheel, which is great because it allows you to smoothly move your exercise regime up in small increments. On top of that, the flywheel is very quiet in use, almost silent. This is great because it means you can watch television while you exercise. There is also a holder for and iPad included, and I can confirm that it is so quiet in use that even the sound from a tablet can be heard. The management console is easy to see details on when you are using it, it’s a bright blue display which is easy to read. It cycles through what you need to know and you don’t have too really focus on it to see. I’m not sure how accurate some of the statistics on the management console are, for example the heart monitor accuracy feels a bit suspect. But this isn’t uncommon on cheaper exercise bikes, and it still gives you a guide as to how you are doing even if it isn’t completely accurate. So in summary, this is a sturdy little exercise bike to use. You can really have a good session on it, without feeling unbalanced, or having to slow down or stop to alter anything. How Powerful Is The Management Console? The panel itself is physically compact, durable and bright to read. The buttons are easy to use and it’s generally fit for purpose. The information is cycled through on the screen so that you can flick your eyes down and see how you’re doing at any time. There are pre-configured exercise routines built in, which is good, and these allow you to get started really quickly if all you want to do is just get on and pedal. You are meant to enter your age before you start the program on this exercise bike. The default is 30, and you have to press a button each time for it to go up one. This is only a small pain, but if you are 70, it means you’ll have to press the button 40 times. This is obviously not ideal for an older person. If you would like to calculate roughlt how many calories you would burn on an exercise bike you can also use this calculator – Click Here. This is not a folding exercise bike. There is a Roger Black gold exercise bike that does come in a folding model, but this is the permanent version. But it is a really compact size, coming in at 133 cm high, 54 cm wide, and just 98 cm deep, so less than a metre in length. So storage is not a problem, as you can simply use the wheel supplied to wheel it into the corner of a room if you don’t have a permanent exercise space. This exercise bike is maintenance free. There is no access to the flywheel, and you don’t need to put lubricant on it, nor do anything other than keep it dust free in normal household maintenance. The biggest negative for me was the seat. It is quite wide and quite hard, and can be literally a pain after a little while. I can imagine a small person would really struggle to be comfortable on this hard seat. This is not unusual either, looking at online consumer reviews, many people mention how hard the seat is. But it can be rectified simply by buying a cheap gel seat cover. I know this is not ideal, but when this exercise bike has such a great build quality and specification for the money, ruling it out because the seat is a bit hard would be a shame. The other negative is the fact that the management console is mains operated. It doesn’t even have a backup battery option. So you have to program it each time the exercise bike is switched off. This isn’t a problem if you are going to leave the exercise bike in a fixed position so that you can leave it plugged in of course. The real downside to this is it cannot then remember information, so you can’t store user programmes or your historical data, such as speed, for comparison. For the price point of less than £200, this is a well built and flexible exercise bike. The Roger black gold exercise bike really is recommended if you are a beginner, or immediate user. The 16 levels of resistance will certainly allow you to push yourself and reach your fitness goals. But, if you are already very fit, or an experienced bike rider then you may find even the top resistance is not particularly challenging. But my conclusion for this review of the Roger black gold exercise bike is that for less than £200 it is great value. It’s well built, sturdy, supplies a good level of information, and is flexible enough in its resistance levels can allow you to gently push yourself up the levels of fitness with ease. All in all, it does live up to the hype, and the professional endorsement in this case is backed up by the quality of the product. If you would like to see a foldable exercise bike by Roger Black then simply Click Here.